With the warmer weather fast approaching, opportunities to travel seem to come up more frequently. Maybe you want to sink your feet in the sand along the Florida Keys or finally stand tall on top of the Empire State building. No matter where you decide to go this summer, tummy troubles can often follow. 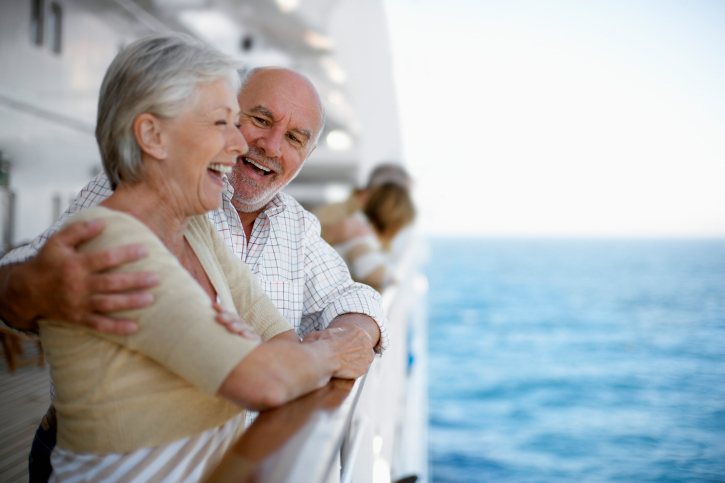 A fear for travelers, especially in seniors, is getting sick while you’re away. No one wants to be stuck in a hotel room instead of enjoying the sights! But we can be more prone to stomach problems when we’re away from home – I’m sure you’ve heard of traveler’s diarrhea by now. The fear of illness can really hinder your decision to venture out, but you shouldn’t let your stomach dictate your level of fun. You may think that anything goes when on vacation so you find yourself indulging more than you usually do when at home. Maybe you want to sample more of the local cuisine, or all those desserts are just too tempting! But if you don’t eat large amounts or many desserts at home, it’s not recommended to do so just because you’re on vacation. If you’re used to enjoying a certain portion size, you’re only setting your stomach up for disaster by over-eating. Worse yet, even a short vacation of over-eating can lead to some weight gain. If you want to sample what the locals have to offer, consider sharing your meal with others to cut down the portion. A change of scenery can also bring changes to your stomach, so you may find you’re more bloated or even constipated. A surefire way to combat this is by staying hydrated – even more so if you’re on a beach or doing a lot of walking on a tour. Bloating may occur on vacation because you are consuming a higher intake of salt. The sodium retains the water and therefore you bloat. But to fight water retention from sodium, you need to drink more water. Staying hydrated can help flush out the excess sodium and relieve the bloating. Before travelling, always look for advisories with regard to water. Many countries carry their own bacteria, so although the locals may not get sick, you’ll be more prone to. Stick with bottled water not only to drink but even to brush your teeth. If you want to still stay regular on vacation, make sure you’re enjoying your fiber, especially first thing in the morning. Consuming a high-fiber breakfast is a great way to set your digestive system on the right track for the rest of the day. Fiber is also helpful in relieving bloating as well as preventing constipation. It’s recommended that the average American adult consume 25 grams of fiber a day. You can obtain fiber from fruits, vegetables and even grains. But don’t let fiber backfire on you! If you stock up on fiber and don’t drink enough fluids, you’ll find the only scenery you’ll be enjoying is that of the bathroom. Up your fiber intake slowly and continue to stay hydrated as well. In a new country or city, you may be introduced to new foods and treats that seem too good to resist. But sometimes it’s these tantalizing foods that can give your stomach some serious troubles. Vacation is not always the best time then to introduce new and foreign foods to your body as you don’t know how your body will react. So before you start sampling, consider if the risk of stomach troubles make it worth the tasting. Because you may not be familiar with many foreign ingredients, the risk of becoming ill becomes higher. On another note, always avoid raw. Although it may seem like a delicacy where you’re visiting, your body will not be able to tolerate it as well as the locals can. Ensure all meat is cooked thoroughly, make sure the milk is pasteurized, and wash fruits and vegetables with bottled water to avoid picking up a bacteria which will send your stomach in loops. If you want to feel adventurous, it’s better to test out new cuisine in the comfort of your own home and not somewhere else. Stomach troubles on vacation can have you learning how to say, “Where is the bathroom?” in many different languages. But that’s not the reason you travelled in the first place. You want to make sure your stomach isn’t preventing you from enjoying the trip of a lifetime. So if you want to see the sights and not the bathroom walls, be prepared and follow these easy steps. Although you’ll never quite avoid all scenarios, always ensure you’re packing medications like antacids and other stomach-healing formulas to get you back to enjoying your vacation – and less worrying about your stomach.